News in this week is that Goldwind are going ahead with constructing a 75-turbine, 175 megawatt wind farm at White Rock near Glen Innes in northern NSW. This will be the northernmost large wind farm in Australia (there are no more windfarms until you get to Windy Hill, a 12MW wind farm near Innisfail in north Queensland). It’s good news for wind energy. The last few weeks in southeast Australia have seen big high pressure systems becalming large areas where most of our existing wind farms are (not an unusual event at some times of year). Nevertheless, solar power has been pumping out the megawatts from thousands of rooftops in the relatively balmy weather that accompanies this, despite the fact that it’s not long past the shortest day of the year. 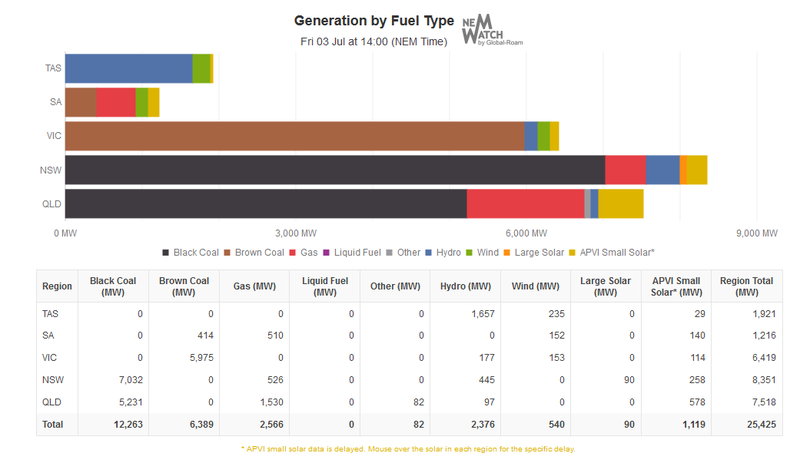 At this point, without widespread windy conditions, and in the middle of winter, renewables (including wind, hydro and solar) were providing about 19.6% of the NEM’s electricity. Victoria’s brown coal behemoths were steaming away at near full capacity, providing 6073MW out of a capacity of about 6300MW. With these southern high pressure systems active, solar output seems good and there’s a fair amount of output from wind in Victoria, but SA’s normally big contribution is low. NSW, with a much smaller installed windfarm capacity, is actually doing very well. This is because towards the edge of a high pressure system, the wind picks up. 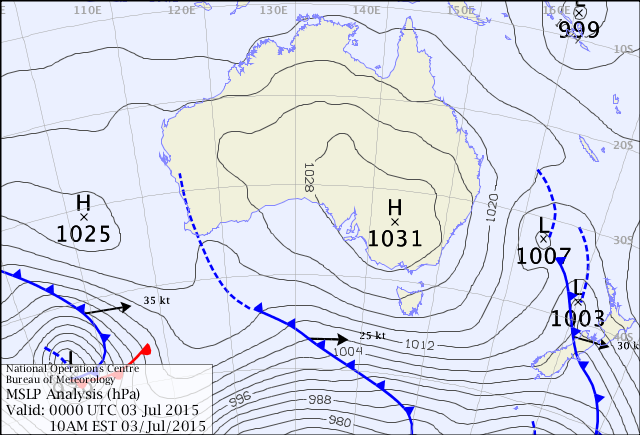 You can see this on the synoptic charts from the BOM (below). If you’re not familiar with how they work, wind travels anti-clockwise around a high pressure system (H) in the southern hemisphere. Where the lines (isobars) are closer together indicates higher wind speeds, as a rule of thumb. This is why it’s good to see wind farms moving north. The huge ongoing contribution from coal shows that building any windfarm, anywhere is good for now. With very accurate forecasts for the output of wind farms available from 24 hours earlier (and more), coal generators can be wound back when the wind is blowing. But spreading wind farms wider across the continent can make that clean energy contribution more consistent. It can help to reduce the number of coal generators needed much more of the time. Combined with solar and storage technologies, it can help move us towards 100% renewable energy. 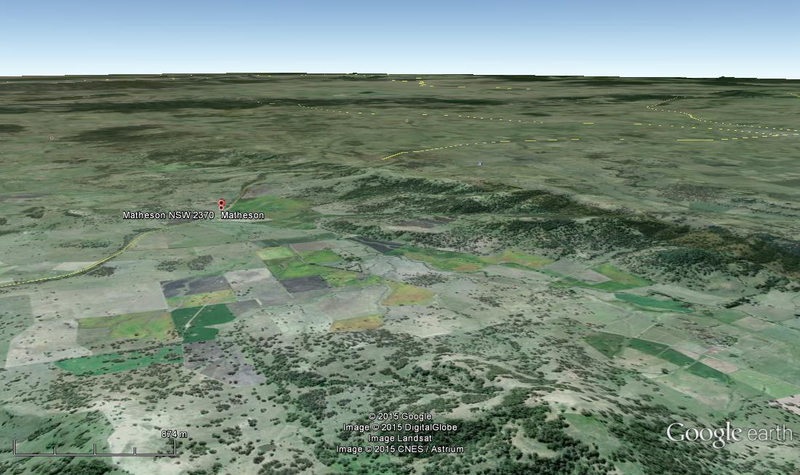 We look forward to wind farms springing up all along the Great Divide from New England to the Atherton Tablelands! We had wind power seventy years ago and gave it away for a very good reason, it didn’t work very well, and it doesn’t work any better now, without Government subsidies, in fact it doesn’t work at all without subsidies. If it did, private enterprise would be building wind farms all over the country. I am opposed to a move to candles. They are an inefficient way to create light, as most of their energy is wasted as heat. Just like creating electricity from coal or gas. It’s also hard to imagine candles being produced sustainably at a scale to supply all our lighting needs. There are also risks of fire and fumes, although if you live in a cave the former may be less of a problem. Personally, I have not tried living in a cave, so can’t comment on that. But I really prefer high-efficiency LED lights to candles, for anything but birthday cakes and the occasional romantic dinner with that special someone. Oh, and by the way LEDs aren’t the only new thing in the last 70 years, there have been developments in wind turbine technology and energy grid systems too, maybe if you lot came out of the cave more often you would have noticed! If wind turbine technology had advanced that much, it would operate in it’s own right and not have to rely on Government subsidies. From what I can see it is very little better than it always has been, just bigger. If wind power is so good, why are the major investors pulling out? I do agree with you about LED’s though, that would have to be one of the most major breakthroughs of all time. Ben I think you are on shaky ground when you are critical of the efficiency of coal and gas power generation in your support for intermittent inefficient wind where turbines have a capacity factor of around 15-30% compared to the capacity factor of thermal power generation is between 70-90%. You need a Bex, a good lie down and a reality check. My god the anti-wind mob are a dour lot. I was joking. However, in this joke, I was talking thermal efficiency of fuel, which doesn’t apply to wind turbines (wind is a free & renewable resource). Maximum thermal efficiency of modern coal power stations is about 39% from memory (and in practice, usually much lower). That’s a measure of how much of the chemical energy in the coal actually is turned into electrical energy. Capacity factor refers to average output over the year (as a percentage of the hypothetical maximum if it ran flat out all the time). 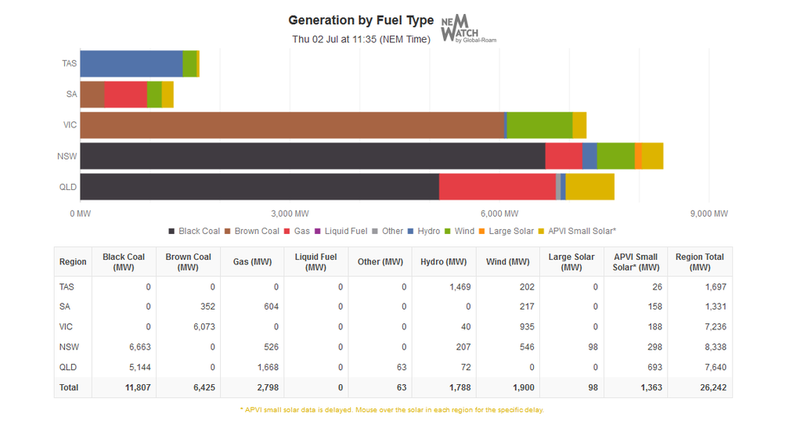 This is often (on an annual basis) about 65-90% for coal; 30-40% for wind farms in Australia (not 15-30%, in your dreams mate); and often as low as 5-10% for open cycle gas turbines which are only used for unusual peak energy events (summer afternoons etc). It’s notable that 30-40% doesn’t mean wind turbines only operate 30-40% of the time; actually it’s more like 70% or more, but they don’t operate at maximum capacity all the time. Wind farm output is predictable with 95% accuracy, 24 hours earlier, so other complementary generation (coal, gas, or preferably stored solar thermal, and hydro) can be easily planned around it. Great to see another windfarm project going ahead. Looking forward to more of them in coming months. Blair – no comment on the Gares! Hey Ben, I’m not sure why people keep thinking that variability from wind matters. The whole point of wind farms, solar, hydro and biofuel is to reduce emissions from fossil fuel power stations. 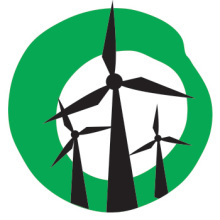 Given that green house gas emission reduction is the objective, wind farms are doing exactly what is intended of them. They generated around 10,000 GWh in the past year. That’s a lot of avoided emissions. So called “intermittency” is just one of the many specious arguments used by people who don’t understand the climate change problem and therefore don’t think anything needs to change in the way we generate electricity or fuel our vehicles. Fortunately there are enough people who do understand the problem and they are getting on with it. No one is saying that all electricity generation has to or is ever going to come solely from wind with no energy storage or from solar with no energy storage. So there’s no need for you or anyone to have to defend the so-called “intermittency” of wind power. It just does not matter. To The Callous Wind: You really need to get a life mate.